PETALING JAYA: Developers are hopeful that the government’s tax relief on interest paid on housing loans of up to RM10,000 a year for three years which will lower the tax bracket for house buyers, promote stronger buying interest for houses and give a boost to the market. The latest measure announced under the second stimulus package or mini-budget will lower the cost of owning a property. “Hopefully the tax relief will also apply to all existing house buyers who have taken loans for their house purchase,” a chief executive of a property company said. If the tax relief only applies to new housing loans, then the impact would be insignificant as buying activities had slowed down tremendously after the global financial crisis hit the country’s shores around the third quarter of last year, he said. In welcoming the incentives for the housing sector, Mah Sing Group Bhd managing director Datuk Sri Leong Hoy Kum said the tax relief on interest paid on housing loans of up to RM10,000 a year for three years would result in further savings on the cost of owning a property. “This will encourage investment in properties which is seen as a good hedge against inflation. We look forward to the further liberalisation of the Foreign Investment Committee (FIC) guidelines which will provide a boost for the property sector,” Leong added. Khazanah Nasional Bhd’s increased investment for infrastructure projects in Iskandar Malaysia and the expansion of the Penang International Airport will also augur well for the property sector. He said by allowing house buyers who had been retrenched to defer the repayment of housing loans for a year, it would provide better cashflow to them and lower the probability of loans going into default. 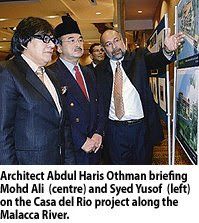 The RM102 million Casa del Rio Melaka boutique hotel, mall and apartment will be operational by June 2010. The four-storey project, involving 64 bedroom suites and 32 apartments, will sit on 1.29ha along the Malacca River. The apartments will be offered for sale. Casa del Rio (Malaysia) Sdn Bhd group managing director Tan Sri Syed Yusof Syed Nasir said that it had invested some RM10 million to acquire the land, which is in addition to the RM102 million investment into the project. Casa del Rio (Malaysia) owns and manages Casa del Rio hotel. Casa del Rio is Spanish for "home by the river". Bank Pembangunan Malaysia Bhd yesterday signed a term-loan agreement of RM50 million with its owner Casa del Rio (Malaysia). A separate agreement was also inked yesterday between Casa Del Rio and Sin Seong Hin Sdn Bhd, where the former awarded a RM60 million contract to the latter to develop the second phase for main building works. On why there is a six months delay in the opening of the hotel, Syed Yusof said that it was a result of the piling work as well as the tender process for the job. Other hotels operated by the group are the 18-room Lakehouse in Cameron Highlands, the 34-room Casa del Mar Langkawi, and specialty restaurants Saloma Theatre Restaurant and Bistro, Hard Rock Cafe and Planet Hollywood in Kuala Lumpur. The Malacca state government has received the green light from the federal government to extend the runway at Batu Berendam Airport, which is slated for completion in six months. Chief Minister Datuk Seri Mohd Ali Mohd Rustam said that the extension at the airport, which will be renamed Malacca International Airport, will cost RM65 million. The extension is to accommodate larger carriers like Boeing B737 and Airbus A320, in line with its goal of making the historical state a top tourist destination. "The runway will be extended to 2,200m from 1,800m now. It will cost RM65 million and the state will take a loan from the federal government for this," Mohd Ali said. This is in addition to the RM135 million grant given to renovate and refurbish the airport, which is operated by Malaysia Airports Holdings Bhd. Mohd Ali said budget carrier AirAsia has indicated that it will fly to three destinations in Sumatra, Indonesia, namely Pekan Baru, Bukit Tinggi and Medan, from Malacca, once the runway is ready. "After that, AirAsia plans to fly to Penang and Langkawi and a year after that to Jakarta, Palembang, Balik Papan and Kuching (from Malacca)," he said after witnessing an agreement-signing ceremony between Casa del Rio (M) Sdn Bhd and Bank Pembangunan Malaysia Bhd, and Sin Seong Hin Sdn Bhd. "Firefly will also be coming in. We now only have Riau Airlines (operating at the airport)," he said, adding that he hopes other charter flights will also operate out of Malacca International Airport. Mohd Ali said the state recorded a total of 7.2 million tourists last year, of which 6 million were domestic tourists. In the first two months of this year, Malacca has already welcomed 600,000 visitors. He added that some 70,000 foreign patients sought medical treatment at the state. "This is only 0.1 per cent of the 7 million rich people who are staying in Sumatra. We need to focus more on Sumatra ... with the new Malacca International Airport, we hope more patients will come here," he said. KUALA LUMPUR: Ireka Corp Bhd’s property development unit, Ireka Development Management Sdn Bhd (IDM), has received the MS ISO 9001:2000 certification for quality management system from Sirim QAS International and UKAS Quality Management. The company’s president and chief executive officer Lai Voon Hon said the quality certification was a further testimony to Ireka’s commitment to develop properties of international standards. IDM is the exclusive development manager for London-listed property developer Aseana Properties Ltd. Currently, the company is managing four ongoing development projects in Malaysia, consisting of luxury condominiums, integrated commercial and offices and an urban development project. In a statement, the company said its maiden project for the development of hotel and office towers in KL Sentral, undertaken by Aseana Properties and Malaysian Resources Corp Bhd, was expected to kick off in the first half of the year. Meanwhile, the company has also received investment licences for two of its upcoming projects in Vietnam. The MS ISO 9001:2000 quality certification is applicable for six core business processes, namely, business planning, pre-development, sales and marketing, sales and administration, project development and post-development. The Real Estate and Housing Developers’ Association Malaysia (Rehda) said the second stimulus package lacks high-impact measures to stimulate the property sector on a wider scale immediately. “Rehda was hoping for a comprehensive Home Ownership package, including stamp duty waivers and other measures to generate demand for houses,” its president Datuk Ng Seing Liong said. However, it hailed measures like the additional RM200 million to build Rumah Mesra Rakyat by Syarikat Perumahan Negara Bhd, saying it will help ease the private sector’s burden of cross-subsidising low-cost housing. Master Builders Association Malaysia president Ng Kee Leen welcomes the Government’s larger commitment to help the rakyat but wants a speedy and transparent delivery system as well as a proper project monitoring to ensure effectiveness of the stimulus package. “The industry could not feel the impact of RM7bil,” he told StarBiz yesterday, pointing out that the peoples’ perception of the first package’s disbursement was slow. Real Estate and Housing Developers Association of Malaysia president Datuk Ng Seing Liong was disappointed with the announcement as some important issues, such as stamp duty relief and provision of grants to first-time housebuyers, were not addressed. He said there were only two new policies that would have direct impact on homeowners – the tax relief on interest paid on housing loans of up to RM10,000 a year for three years and the deferred repayment of retrenched workers’ housing loans for one year. “A lot of money goes into contracts instead. What is important is the money goes to the people on the street so that it will have a better multiplier effect. The impact will then be faster,” he told StarBiz. The Nomad Group Bhd, formerly known as Kuala Lumpur City Corp Bhd, has completed the acquisition of a property in Jakarta for 85 billion rupiah (100 rupiah = RM0.03) from PT Pulo Mas Jaya. The property, comprising 2,553 sq m land with a nine-storey office building, is known as Menteng Office Park. The company told Bursa Malaysia Bhd that the purchase of the property, located at Probolinggo 18, Menteng in Central Jakarta, has been completed on March 5.